Natriuretic peptide receptor-C signaling and regulation. The natriuretic peptides (NP) are a family of three polypeptide hormones termed atrial natriuretic peptide (ANP), brain natriuretic peptide (BNP), and C-type natriuretic peptide (CNP). ANP regulates a variety of physiological parameters by interacting with its receptors present on the plasma membrane. These are of three subtypes NPR-A, NPR-B, and NPR-C. NPR-A and NPR-B are guanylyl cyclase receptors, whereas NPR-C is non-guanylyl cyclase receptor and is coupled to adenylyl cyclase inhibition or phospholipase C activation through inhibitory guanine nucleotide regulatory protein (Gi). ANP, BNP, CNP, as well as C-ANP (4-23), a ring deleted peptide that specifically interacts with NPR-C receptor inhibit adenylyl cyclase activity through Gi protein. Unlike other G-protein-coupled receptors, NPR-C receptors have a single transmembrane domain and a short cytoplasmic domain of 37 amino acids, which has a structural specificity like those of other single transmembrane domain receptors. A 37 amino acid cytoplasmic peptide is sufficient to inhibit adenylyl cyclase activity with an apparent Ki similar to that of ANP (99-126) or C-ANP (4-23). In addition, C-ANP (4-23) also stimulates phosphatidyl inositol (PI) turnover in vascular smooth muscle cells (VSMC) which is attenuated by dbcAMP and cAMP-stimulatory agonists, suggesting that NPR-C receptor-mediated inhibition of adenylyl cyclase and resultant decreased levels of cAMP may be responsible for NPR-C-mediated stimulation of PI turnover. Furthermore, the activation of NPR-C receptor by C-ANP (4-23) and CNP inhibits the mitogen-activated protein kinase activity stimulated by endothelin-3, platelet-derived growth factor, phorbol-12 myristate 13-acetate, suggesting that NPR-C receptor might also be coupled to other signal transduction system or that there may be an interaction of the NPR-C receptor and some other signaling pathways. In this review article, NPR-C receptor coupling to different signaling pathways and their regulation will be discussed. 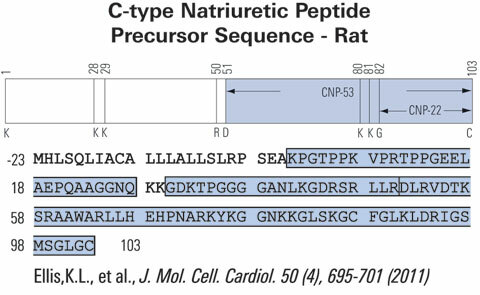 C-type natriuretic Peptide down-regulates expression of its cognate receptor in rat aortic smooth muscle cells. 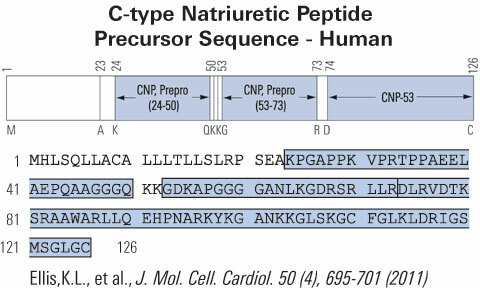 The C-type natriuretic (CNP) peptide signals through the type B natriuretic peptide receptor (NPR-B) in vascular smooth muscle cells to activate the particulate guanylyl cyclase activity intrinsic to that receptor and raise cellular cyclic GMP levels. In the present study, we demonstrate that CNP down-regulates the expression of this receptor leading to a reduction in NPR-B activity. Pretreatment of rat aortic smooth muscle cells with CNP reduces NPR-B activity, NPR-B protein levels, NPR2 (NPR-B gene) mRNA levels, and NPR2 promoter activity. The decrease in NPR2 promoter activity is dependent on DNA sequence present between -441 and -134 relative to the transcription start site. The reduction in NPR2 gene expression appears to operate through generation of cyclic GMP. 8-Bromo cyclic GMP, a membrane-permeable cyclic GMP analog, reduced NPR2 mRNA levels and NPR2 promoter activity. 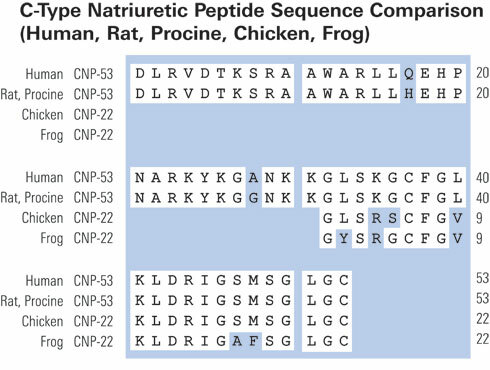 Atrial natriuretic peptide, which signals through the type A natriuretic peptide receptor (NPR-A) to increase cyclic GMP levels in these cells, also reduced NPR-B mRNA levels and inhibited NPR-B promoter activity; however, this inhibition was not additive with that produced by CNP, implying that the two ligands traffic over a common signal transduction pathway. This report provides the first documentation that CNP is capable of autoregulating the expression of its cognate receptor. Radioimmunoassay for plasma C-type natriuretic peptide determination: a methodological evaluation. C-Type natriuretic peptide (CNP) is a member of the family of natriuretic peptides with vasodilatory properties, and is produced and secreted by endothelial cells. It seems to play a central role in the paracrine vasomotor control of tone and to be important in several clinical conditions characterized by endothelial dysfunction. We evaluated the analytical performance of a commercially available radioimmunoassay for CNP (CNP-22 (Human, Rat, Mouse) RIA Kit, Phoenix Pharmaceuticals, Inc.) after a preliminary extraction with Sep-Pak C18. Its analytical reliability was checked by determination of CNP plasma levels in healthy subjects (n=23) and in patients with different diseases, likely characterized by endothelial dysfunction, such as chronic heart failure (n=133) and cirrhosis (n s 84). The extraction yield was 78+/-3%. Accuracy of the radiommunological determination was evaluated by dilution (45-370 [mu]L of extracted plasma) and recovery tests (>80%). Between- and within-assay variabilities were <=10% and analytical sensitivity was 0.41+/-0.015 pg/tube. Plasma CNP in patients with chronic heart failure and with cirrhosis was significantly raised compared to controls (p<0.0001 and p=0.001, respectively). The sensitivity, accuracy and variability levels of the method proposed for CNP assay was suitable for reliable detection of changes in CNP plasma levels in the clinical setting.